The black-headed jay (Garrulus lanceolatus) belongs to the family of jays and magpies, the Corvidae. The black-headed jay species is distributed in India, Nepal, Pakistan and Afghanistan. These jay species are mostly found in Himalayan foothills at elevations from 1,500 to 3,000 meters. These jays are monotypic species. The black-headed jay (Garrulus lanceolatus) is a medium-sized jay, measuring 30 to 33 cm in length and weighing 80 to 100 grams. The black-headed jay has a blackish hood and erectable, blackish crest. The upperparts are greyish-pink and the underparts are pale fawn. The wings have dark gray and blue bars. The long, blue tail is barred. The bill is short, thick and silvery white. The irises are blackish brown. The legs and feet are pale gray. The call of the jay is a unpleasant, grating "skaaaak" sound. The black-headed jay species are distributed in India, Nepal, Pakistan and Afghanistan. In India, they are distributed in the states of Jammu and Kashmir, Himachal Pradesh, Uttarakhand, Uttar Pradesh and Punjab. 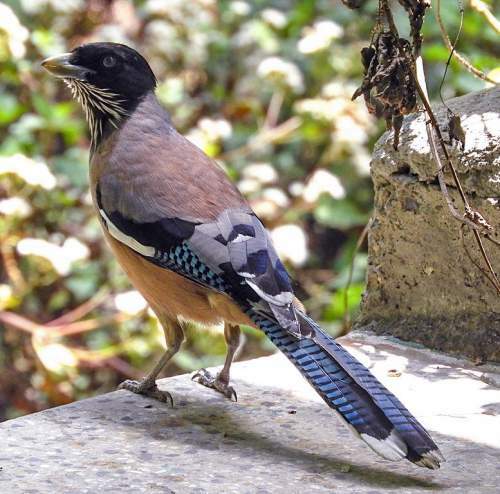 The Important Bird and Biodiversity Area (IBA) of the black-headed jay species in Nepal are Annapurna Conservation Area, Phulchoki Mountain forests, Langtang National Park and Bardia National Park. These black-headed jay species have moderate forest dependence. They normally occur in altitudes from 1,500 to 3,000 meters. The artificial ecosystems and habitats of these species include agricultural lands. The natural ecosystems and habitats of these species include tropical and subtropical moist montane forests, pine-oak forests and tropical and subtropical high altitude shrublands. The diet of these black-headed jay species consists mainly of invertebrates and seeds. Invertebrates, small vertebrates like lizards, small birds, eggs and hatchlings are their primary food. These jays feed both on the ground and in trees. 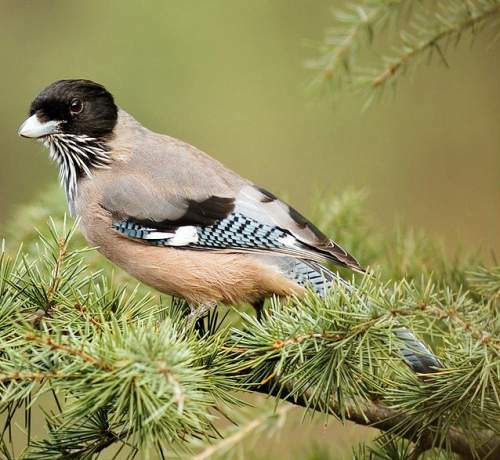 The wintering birds feed on seeds, berries and pine seeds. They sometimes get used to picking scrap food from human settlements. The breeding season of the black-headed jay species is from April to June. These birds are monogamous and territorial. The breeding sites are located in trees and bushes. They nest is a loose cup, built by both the parents. The clutch contains 4-6 dirty white eggs. Both the parents incubates the eggs and feed the young. The chicks hatch out after 16-19 days and fledge after 21–23 days. These black-headed jay species are non-migratory resident birds. The populations in higher elevations may move to lower levels during winter. The global population size of the black-headed jay (Garrulus lanceolatus) has not been quantified. The overall population trend of the species is considered to be stable. In most of its range, this species is reported as common. The generation length is 7.5 years. Its distribution size is about 639,000 sq.km. Habitat alteration, fragmentation and destruction, hunting and capture for pet-trade are the main threats that are endangering the survival of these species. 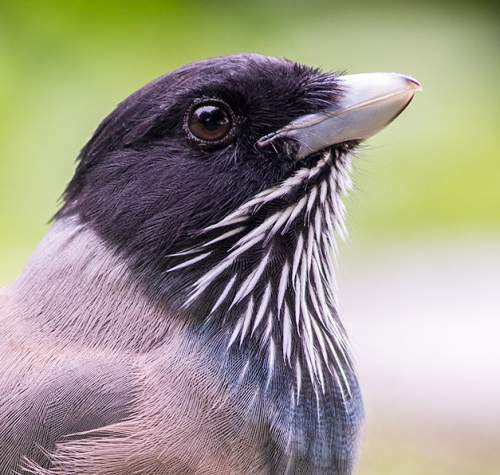 The black-headed jay (Garrulus lanceolatus) does not approach the thresholds for being Vulnerable either under the range size criterion, or under the population trend criterion or under the population size criterion. The CITES (Convention on International Trade in Endangered Species of Wild Fauna and Flora) status is ‘Not Evaluated’ for the black-headed jay (Garrulus lanceolatus). The black-headed jay (Garrulus lanceolatus) is closely related to Lidth's jay (Garrulus lidthi) and Eurasian jay (Garrulus glandarius). Current topic in Birds of India: Black-headed jay - Garrulus lanceolatus.